I made this yesterday. I got the idea from something my sister did with her staff last Valentine's Day - they created a Tree of Love. Everyone brought in pictures of their loved ones and hung them on a potted tree in the office. I thought it was such a lovely way to celebrate Valentine's Day - sharing your loved ones, visiting them during the day, and getting to know your co-workers better. We don't have any house plants yet or any co-workers for that matter so I morphed her idea into this I Love You garland. 1) I printed pictures off the computer on to regular old paper. I didn't worry or fuss about the size - those kind of details drive me mad. 2) I glued the pictures onto red construction paper. 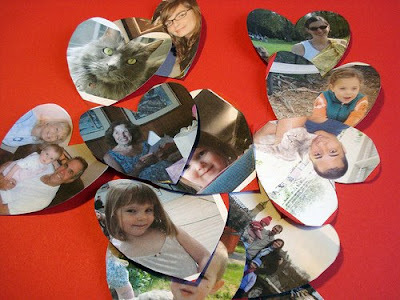 5) Cut out the hearts. Pressed them in a heavy book overnight. 6) Sewed them onto bakers twine, about every 4 inches. I used a sturdy needle threaded with 2 strands of embroidery floss. Went through the heart first and then through the twine. Cut and knotted on the back of the photo. This will probably stay up way past Valentine's Day - its nice to have our loved ones so close. Super cute! Love the baker's twine! 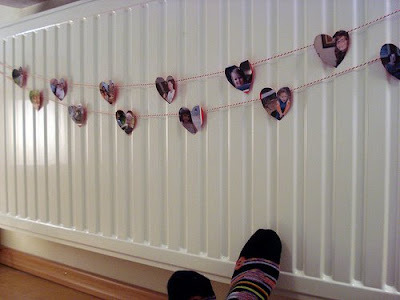 I love this idea and what a great way for your children to think about their family and friends even from a distance. I'll be curious to see how Valentine's Day is celebrated there. Dutchy! what a cute idea! Love it!! wonderful! If Crafty Crow deosn't have you yet, you should go over and point them to this post! SUPER CUTE!!!! I have all sorts of garland images running through my head and need to sit down and actually make one!!! You are SO creative! WOW! I Love it. How did you think of it? I absolutely LOVE this idea. Something to keep up all year round, too! this is so pretty! what a great idea :) Thank you for sharing it. This is SOOO fantastic! What a fabulous idea. My garland would be full of family and pets...I'm totally going to have to do this. 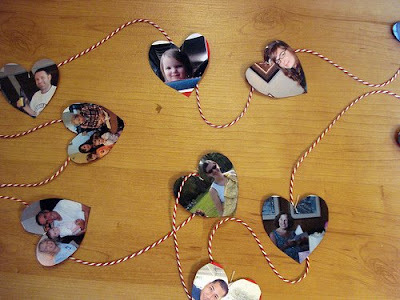 What a sweet keepsake...Thanks so much for sharing this creative idea, I'll be linking. 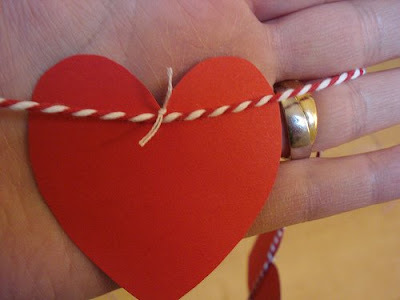 Hmmm..I'm trying to think of how to turn this idea into valentines for the kids' classes. Necklaces?? So adorable. these are amazing! really love them! This idea is so awesome. I will be doing this tomorrow in my daycare center. Thanks for sharing.